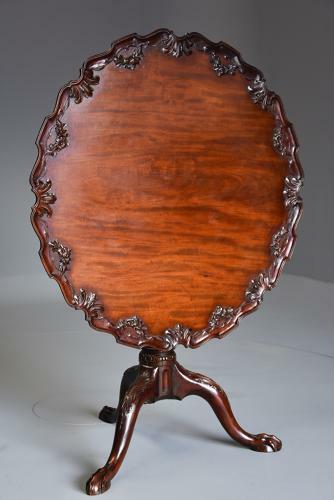 This table consists of a mahogany top of superb patina (colour) with applied floral and foliate carved decoration with an applied piecrust decoration to the edge, the top can either be secured down or tilted. The top is supported by a bird cage consisting of four turned gun barrel supports leading down to a turned column with fluted and reeded decoration. The table is supported by three cabriole legs with foliate carving to the knee terminating with claw feet.